Spent this afternoon leveling fishing and cooking on Mariposa. Im now at 242 cooking and 225 fishing (need to complete the quest). I also managed to pick up 11 honourable kills, it turns out that STV is not a relaxing spot for doing a spot of fishing. So why am I, at this stage of the game leveling fishing and cooking on a character ive been playing for 3 years? Achievements, a system that Blizzard are implementing with this upcoming expansion. Basically you get points for a variety of things, collecting minipets, tabards, having professions maxed out and so on. But the main reason for the sudden interest in fishing is the simple fact that the expansion will bring the number of mini pets only obtainable through dipping a rod into the water to 6, 4 baby crocs, 1 crawdad and 1 gnome sized rat. I need a gnome sized rat, it will make my priest complete. Thus i need to be able to fish in Dalaran, so im working away on making sure ill be ready as soon as i can access the city. Mariposa has obviously been away from her homelands far too long. In rare moment of drunkeness, she allowed some gnome (at least she thinks it was a gnome, might have been a small devil though) to talk her into joining the Beer of the Month Club. 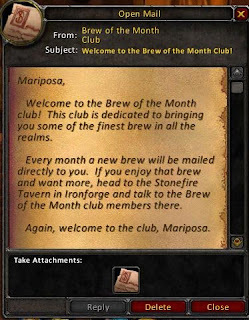 This is a newly implemented for Brewfest 2008 and the first sample makes you talk in Gnomish Binary… brings my inner computergeek to the fore. 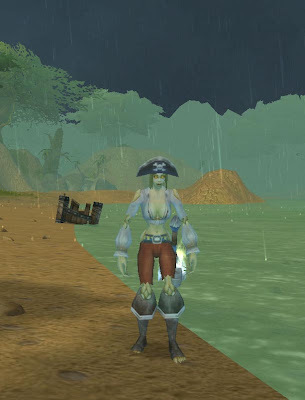 Its talk like a Pirate Day.